Across Cuba, along the coast of Jamaica through Panama and down the coast of South America until our next destination; Lima. Early morning hours we arrive a little before 5am; forms to fill out, customs agents, and passport stamps, baggage claim and before the sun has awaken we step out into the Peruvian air. Peruvian Airlines check in to Cusco, gift shops, finger puppets, drugs at the airport pharmacy; airport taxes and security checkpoints as we make our way to wait for our 9:30 flight out of this Capital city. I have declared my newest find, a Peruvian finger puppet of a monkey eating a banana, to be our trip mascot and I have decided that he will be my Tibi stand-in for the duration of the next two and a half weeks. It seems like it took forever to board that plane as sleep deprivation sets in; anticipation rising to embrace the heart of Peru while Carmen and Chala sleep across airport chairs and Deniz, Cindy and I capture pictures of our airport excursion. It is a relief as we finally board flight 9216 eastbound to Cusco. As we venture on, snow capped mountains pierce the clouds and as we fly above them the magnitude of the Andes mountain range is unrealized but the aerial view is worth capturing. In many places small villages only add to the intriguing landscape and bright blue lakes sparkle like sapphire gems. Flying into Cusco was captivating; while many areas look shanty, the old structures and architecture were every bit of fitting for an ideal historical city in South America. As we land I feel nervous about the altitude, as if when they open those airplane doors the wind will be knocked out of me as I gasp for air, feeling the pressure hard against my chest and I wait for that moment without any reserves on how it will be here in the Andes. I express my concern with Deniz as he laughs at my dramatic attempts to explain what I am expecting at any moment. The doors open and at that moment…nothing! I walk off the plane and into the airport thinking “Wow, that was overrated.” Everything I had read seemed nothing like what I was experiencing. If anything I feel like I can breath better than any other point in my life. Winding through the crowds that fill the local airport, tour guides beckoning to grab your attention, and taxi drivers trying to swindle a few extra soles as you exit the front doors. Fifty soles, forty-five, thirty soles…sold! 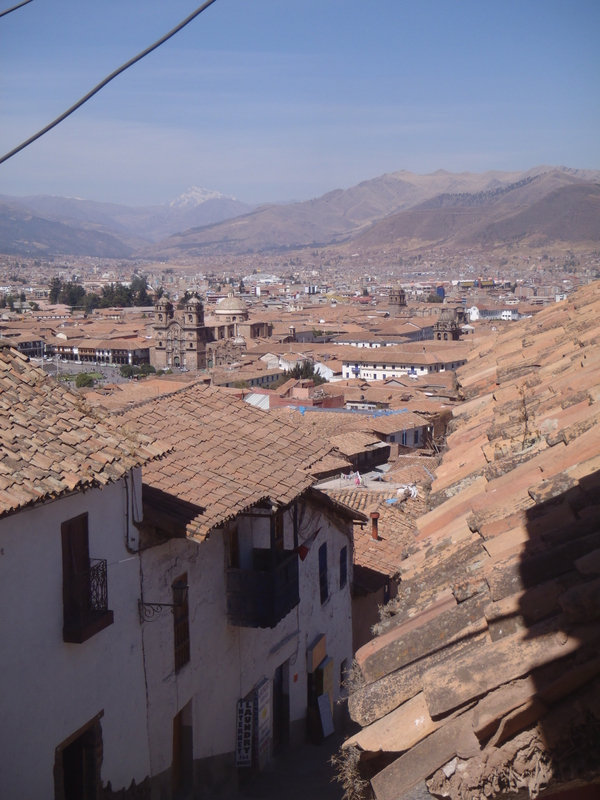 Driving to our hostel gave us a view of Cusco that we other wise would have not experienced. Hanging out the window,trying to capture pictures of the city as we drive up the hillside to our hostel located outside the tourist district of Cusco. We finally arrived at Loki Cusco, the party hostel of Peru located in a 500 year old refurbished architectural masterpiece of its time. Deep reds, wooden railings, grass court yards and a bar stocked with Pisco, cervesa, tequila and Inca Kola. After we got settled in, admiring the view which overlooks the city from our balcony and claiming which bed will be ours for the next couple nights, Carmen and I set out down the hillside to the historic square below. Stairs leading the way down, short fire hydrants, Volkswagen bugs, old streets, church spires, and arch ways; women selling Chicha, fresh juice in plastic buckets, street food and anything else you can imagine. A market filled with Alpaca sweaters, hanging meat and pigs heads, coca leaves, fruits and vegetables n ew to the eye; fruit and honey desert stands lined with stools and ladies leaning in to entice you with the many choices listed on their menus. Lines of people eating soup and delicious Peruvian cuisines; Lomo Saltado jumped with huevo, sopa y cola, chuleta frita y pescado. Cusco is a beautiful city and after the drilling walk back up the hill to our hostel we are ready for a short nap. Afterward our tour guide, Edgar, will come to the hostel to discuss our upcoming adventure. As 7 pm arrives Edgar is still not here, yet he calls to let us know he will be late. After 45 minutes later he arrives apologizing for his tardiness, just my kind of people! Always late, I will fit in to such a laid back society. We went through how our trek will be and what to expect; gaining even more excitement as we get even closer to the morning we set out. We then met up with two new friends we met earlier in the lobby, Emily from Greece and Rachel from England, to eat our first Peruvian dish. After searching for Sumac Mijuy,which was on Loki’s list of recommendations, we gave up and settled for a restaurant which had a list of Peruvian favorites on the menu and for a reasonable price. Alpaca skewers with boiled potatoes and Peruvian salad for me please while Deniz was more daring and ordered Cuy, better know as Guinea Pig. A gamy taste with a slight resemblance to roasted lamb shank; just enough for me to get the idea but not sure if I could eat the whole thing. Back to our hostel to see the Funk Rock band play, dance til close and watch as the others enjoyed the local Peruvian beer. Carmen and I ended the night early around 2am while the others were not ready to settle in and ventured out into the city. Tomorrow we set out to take in more sights and visit the Inca ruins near Pisac.